I was so hoping that Jim Jordan would be elected House Minority Leader. I reckon the Republican Party is still the party of establishment Rinos, not patriots. 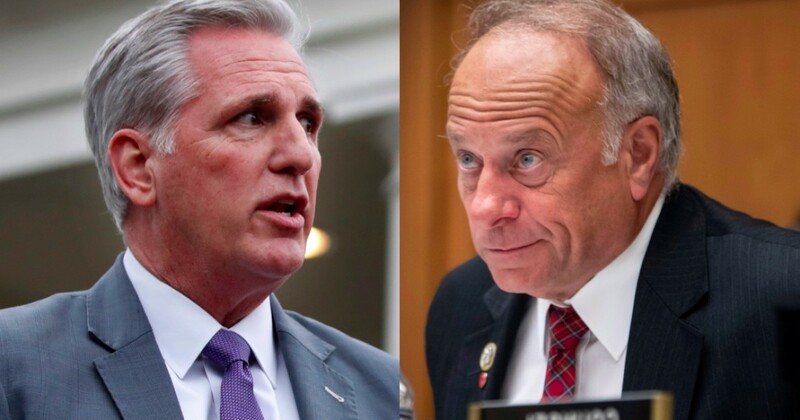 Kevin McCarthy, the new House Minority Leader, is promising to join Democrats to throw fellow Republican Steve King under the bus for having been quoted out of context by a New York Times reporter. It is the politically correct thing to do and McCarthy is as politically correct and spineless a leader as Paul Rino. But, it is not the right thing to do. The Democrat-manufactured hubbub du jour involves Iowa Republican House member Steve King’s interview in which he questioned how now-toxic terms like white nationalist, fascist, white supremacist, and Nazi, terms employed intermittently by Democrats and MSM talking heads alike to describe Republicans and anyone else they have a disagreement with, became so misdefined. Having worn out the term “racist,” Dems are upping their game to include the new descriptors as a means to drive public support away from Republicans, a tactic that seems to be working well. In his 56-minute unrecorded interview, King described how certain words, like “nationalist,” have become toxic and are now used openly to describe anyone opposed to the liberal agenda as a racist. Now, rather than support King and defend him from the dishonest Democrats and mainstream media in a most vulnerable moment, McCarthy is joining the liberals to destroy King, an unashamed patriot. No, it isn’t! It is the purest form of disloyalty from a scumbag who has found himself in an important position and who is unable to see what is happening around him. The Republicans should vote again and replace him with a patriot. America must trust Republicans to look out for We the People. Kevin McCarthy is not looking out for Republicans. He is throwing America under the bus with King. Now, watch as CNN liberals attempt to perpetuate their talking point that the term “nationalist” is synonymous with “racist,” which means, of course, that, to them and anyone who believes them, all who love America are racists. See how it works? Exactly! That is what a nationalist is, a patriot. I am a nationalist, a proud nationalist. I am also a Caucasian, so saying that I am a white nationalist would not be incorrect. There are also black nationalists, Hispanic nationalists, and Asian nationalists in America. It is not something to be ashamed of. Rather, it is something to be proud of. President Trump is a nationalist. However, the Democrats and their mouthpieces in the mainstream media have successfully convinced a great number of morons, many of whom serve in Congress, that being a “nationalist” is being a racist. Way to go, Rino! Who gave you that speech, Jeb or Paul Rino? You are right, Dems don't throw Dems under the bus. Only Republicans do that! King is being attacked unfairly by Dems & MSM & you are playing into their hands. They are laughing at you, how easy it is to manipulate you! Roger that. Just what we need, another Rino. Out goes Paul Rino, in comes Kevin McCarthy, more than happy to throw fellow Republicans under the bus for being unfairly attacked by the Dems and MSM. So, who does McCarthy side with? The Dems and MSM. Common scum! Pelosi can take no more action than McCarthy, who is talking about taking action within the party. You act like Pelosi can fire King or something. She can propose a censure, which is nothing. Big deal! McCarthy is a Rino, joining Dems to unfairly throw King under the bus.